During our recent trip to Vietnam, we took the kids to a traditional Vietnamese Water Puppet show. The art of puppetry originated in the rice fields in the north of the country around Hanoi. Puppetry is believed to be passed through the generations from father to son. We saw a water puppet show on our last visit to Hanoi 12 years ago and I thought it would be a great cultural experience for the kids while travelling in Vietnam. 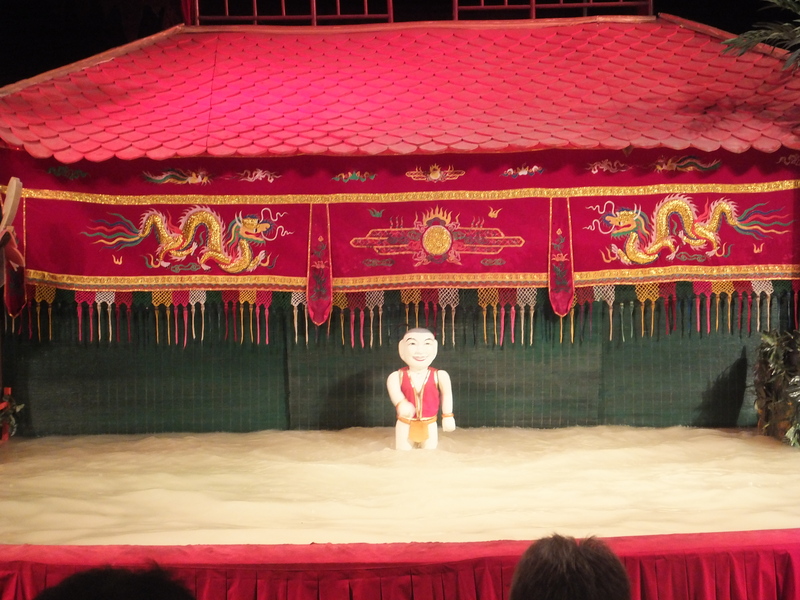 Water puppetry is now common outside of Hanoi so we were able to see a show in Ho Chi Minh City. I also noticed that there is a Water Puppet show in Nha Trang but we didn’t have enough time to visit so I was happy to be able to get tickets in HCMC. We did a Cyclo Saigon Tour we stayed at the Signature Saigon Hotel. It’s a very affordable experience, not that anything is overly expensive in Vietnam but I found this to be cheaper than I had expected. To book your own experience I highly recommend using Klook Vietnamese Water Puppet Show, you’ll secure a competitive price and it will ensure you get the date that you are looking for. I also recommend the Vietnamese Water Puppet Show with Dinner Cruise and Cultural Show. The theatre is not flash, its very simple, if you have young kids, try and get tickets closer to the front because they will struggle to see from any further back that the 4th row. We sat in the 4th row and we had no one behind us so I let the kids stand so that they could see better. Our hotel the Signature Saigon Hotel was located in District 1, the Golden Dragon Water Puppet Theatre is located in District 19, while this sounds like quite a distance it’s only 2.9kms and is located close to a lot of other main attractions such as the Saigon Zoo, Notre Dame Cathedral, HCMC Town Hall, Reunification Palace and the HCMC Post Office. 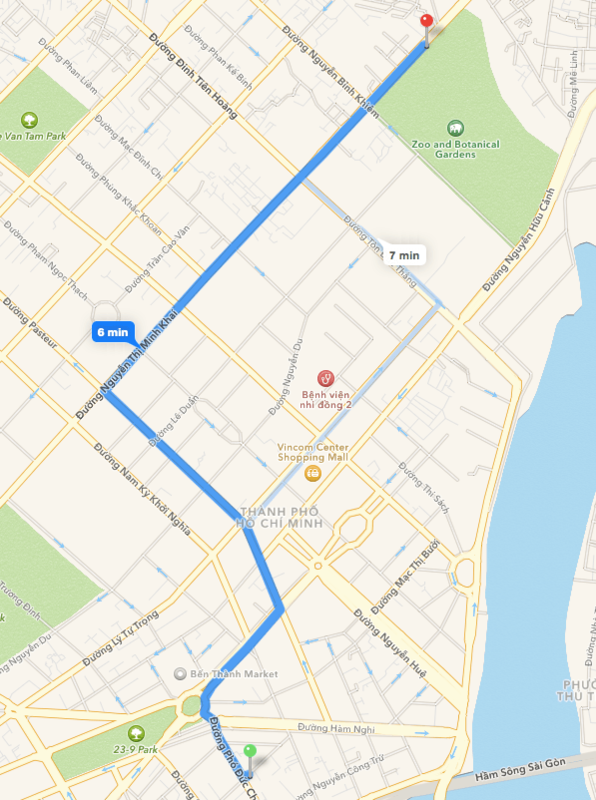 Here a map of the route from our hotel to the theatre. The price of the tickets included a one way taxi ride to the theatre, the hotel organised this once we arrived in the foyer. I got a receipt from the tour desk that I handed to the lady at the box office and she gave me our tickets. The theatre was within walking distance from our hotel so we walked back to our hotel (in the rain!) stopping for dinner on the way! The kids were feral by this time and we couldn’t find a decent place but that’s another story! Its also not far from the Ben Thanh market so located close to District 1. I was a bit worried that the kids wouldn’t be interested but they loved it. Especially the younger two, Caelan could hardly take his eyes off the production. Keira had an intense stare and I don’t think she even blinked. Alannah said it was great, but wished it was in english! I think if it was in english it would have taken away from the story and I hope they ever do that. We had a little boy sitting behind us, he must have been about 2 or 3, he was laughing his head off! It was so lovely to see him enjoying it so much and my kids thought he was lovely. Every time he laughed they would turn and smile at him, he was a little cutie too. Craig and I loved watching the kids enjoy the show so much, they were tired from our trip to the Mekong Delta during the day so to be fair it had been a long day for them. I was proud that they enjoyed it and intently watched, what more could I ask for. Action shot of the water puppets. I couldn’t recommend this traditional experience any higher, for kids and adults. For the price, why wouldn’t you! HCMC is such a great city to visit with kids, I mentioned a few activities above but other ideas include a day trip to the Cu Chi Tunnels which provides insight into how the VietCon defeated the America’s in the Vietnam War. We also did an independent walking tour of District 1. We love getting google maps up and just exploring by foot. Its a great way to see a city. You’ll love Vietnam, I can’t recommend it anymore highly, just make sure you eat all the food! It’s amazing! Looks great, I should have gone and seen a show when I was there! It is a great cultural experience, its funny how the kids had no idea what was being said but they managed to follow along and enjoy it. I was really proud of them considering they were a bit tired and emotional! Did you love Vietnam? What was your favourite?